Every once in awhile I'd see comments on posts featuring books a long the lines of, 'Oh I love that you read so much. I'm a Mom to a baby boy and I just don't have time for books anymore.' Honestly, I couldn't fathom not having time for books. Even at my busiest, working almost all waking hours of the day, I read for pleasure. On the eve of becoming a Mom myself, I wondered, however doubted, if I'd start muttering that phrase too but I'm pleased to say, even in the most tired phases of the last few months, reading has remained a constant. In my 31 years, I've realized that life is all about choices and often times we make excuses for what we can and can't do when really, it's just about prioritizing what is important to us. Reading is important to me. It's been quite awhile since I've done a Recent Reads post and quite a few books have been added to my bookshelf. I won't go through them all here but you're welcome to check out my Goodreads account. Lately, I've been indulging in easier reads. When the entire body, mind and spirit is tired, a simpler plot line is easier to keep up with particularly when I'm picking up my Kindle in the middle of the night for a 3, 4 or 5 am nursing session. This is a story of a blind girl who lives with her father in Paris paralleled by the story of a young orphan boy in Germany during World War II. As the war breaks out, Marie Laure and her father leave Paris to live with an uncle while hiding one a precious and sought after jewel. Conversely, Werner's knowledge and expertise in radios land him at an academy for Hitler Youth. Eventually, the paths converge. I know what you're thinking… another WWII story Jay?! But, hear me out. This is less about the war and more about the stories of these two kids. It is beautifully and intricately written and it has earned a spot on my best reads of 2014 list. I bought it for my dad for Christmas and it's my number one recommendation to those who ask. 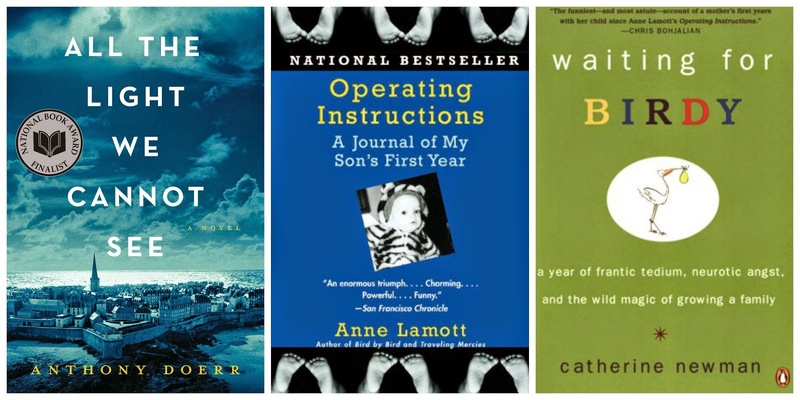 Anne Lamott is a fairly well known author and teacher and her memoir about raising her son as a single parent graces the recommended reading lists for new mothers. She chronicles the year, month by month, challenge by challenge, laugh by laugh. Not just about parenthood, there is also the parallel story of her best friend's diagnosis and battle with cancer. Women, blogging women, tend to love this book. I didn't love it. I didn't hate it. It was fine. There were some funny parts and definitely some relatable parts and I did catch myself smirking here and there but I just didn't relate to Anne the way I thought I would. This might be one of those situations where I had grand expectations and the reality just didn't live up to it. I'm not saying don't read it. I'm just saying, it wasn't my favourite. Catherine Newman is also well known for her column on babycenter.com chronicling parenting her son and daughter. Waiting for Birdy is her story of raising one child while waiting for the second. Her three year old boy, Ben, could melt the hearts of just about anyone and Newman's own, often anxious, pregnancy is completely relatable and funny without being silly and self deprecating. This is the book I'd tuck into gifts for new moms or second time moms or pregnant friends or just about anyone. It is funny. And it's not stupid funny with potty humour and other things one expects from a 'Mom read.' It's well written and it's hilarious. There were times where I tried to control my laughter as I wondered if my shaking would wake the baby. I found this book smart, clever and entirely relatable. A.J. Fikry is a book store owner on a small island who is not known for being overly personable. He lives alone after the death of his wife, drinks regularly and his less than profitable bookstore could go under in the near future. With the appearance of a love interest and a young girl abandoned in his bookstore, A.J. 's life changes quite drastically. When I read the description of this novel I immediately thought, 'This was written for me!' A book about a lover of books who owns a bookstore - easy win for a fellow book lover. In reality, I didn't love it as much as I wanted to. At times it was a bit predictable and sometimes the actual writing just didn't capture me. Again, it wasn't bad and the story was cute but it was forgettable. 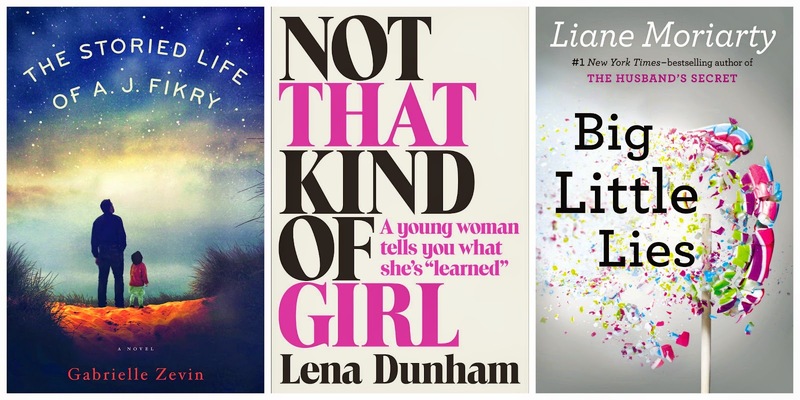 "Girls" writer Lena Dunham's highly anticipated novel came out and along with legions of other fans, I couldn't help but buy it opening week. For the fellow "Girls" watchers, this novel strikes the same tone. Often controversial, the stories are so honest and forthcoming they leave you blushing. It's sort of like a wide open door into the life of Lena and sometimes you see more than you bargained for. I think I stand with many who were a bit underwhelmed by the book. Perhaps the hype worked to its disadvantage or perhaps the HBO sitcom is enough for me but I just didn't connect with it like I wanted to. I found the stories jumped from here to there to here again and it was difficult to follow the connections between them. As always, I do give Lena credit for being so candid about the things that so many of us experience yet try to forget, let alone tell the world about. Set in Australia, we follow three women who are brought together by their children entering the same kindergarten class. Starting with a death at a school event, Big Little Lies works its way backwards, chronicling the relationships of these women and the other school Moms. While we know someone is dead, we don't know how it is until the bitter end. There's the stereotypical clique-y women, gossip, controversy, etc. with some humour, some sadness and a little love story thrown in for good measure. This book is the definition of an easy read - the kind you want to take to the beach or on vacation. It draws you in quite quickly and the writing is simple. I enjoyed it. I ploughed through it over a week in the midst of major exhaustion and still kept up with what was happening. At times, I felt the writing and description to be a bit juvenile but it certainly wasn't predictable. Another book I didn't love but it was just fine for what it was. I just purchased the next Flavia de Luce novel this morning and haven't read a single word of it yet but I'm looking forward to checking in on this precocious little girl. This is the 7th in the series - I've blogged about the others in other editions of Recent Reads if you're curious. I just ordered the paperback version (not available on Kindle yet) in anticipation of our Spring trip to Croatia. It definitely is just a matter of priorities, just like anything else... so good for you for sticking with it! I also read Lena's book and kind of felt the same way you did about it. It helped to piece it together a bit having watched her first film Tiny Furniture (which is basically autobiographical) and some bits and pieces of girls (like how Jessa worked at that childrens' clothing store for awhile!) but yeahhh, underwhelmed. I will give your first recommendation a try because I've had a bad habit last year of choosing really fantastic sounding classic titles or really boring biographies. It's time for something really gripping! I hope you like it Cynthia! You'll have to let me know what you think! I felt the same about The Storied Life of A.J. Fikry- it had a lot of promise, but fell short. Not a waste of time, but not the best, unfortunately. I did love Big Little Lies, though. I liked how it felt like an easy beach read, but had more substance, and the characters seemed more real and believable than the average chick lit. I definitely preferred it to The Husband's Secret or The Hypnotist's Love Story. I haven't read either of those, Gesci. You're right - the characters in Big Little Lies did have some dimension to them which was nice for an easy read. I just found myself rolling my eyes here and there at the writing. I'm with you on loving WW2 era books! They're always so good and so emotional. All the light we cannot see is high on my list! You should add "Small Island" to your list as well if you haven't already read it!